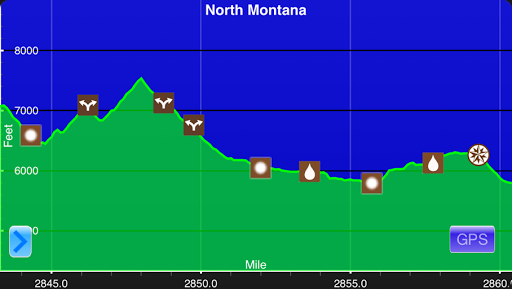 This elevation chart is a screenshot from Guthook’s CDT Hiker App. We awoke to condensation on the tents again this morning. I had hoped that up high that wouldn’t happen, but there wasn’t any wind last night and we were in grass, so it got a little damp. It’s amazing to me how silent it can be during the night. Sometimes, I forget I’m outside when it’s so quiet and wake up momentarily thinking I’m in a bed in a home. We got going at our usual 6:30am and had some nice scenic walking along the Wall for a bit longer. There were a few miles of uphill that made for a good workout. I prefer climbs like that in the cooler morning, but we were already dripping sweat before 8am. It was going to be a hot one. 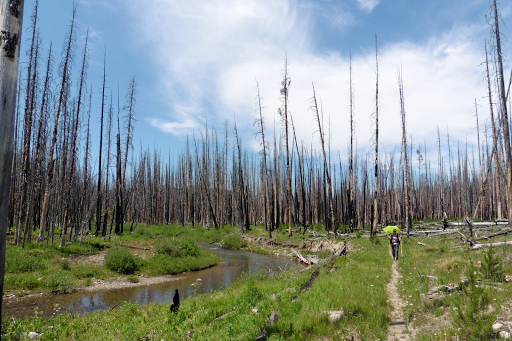 We soon dropped down into a forest for a four mile descent. 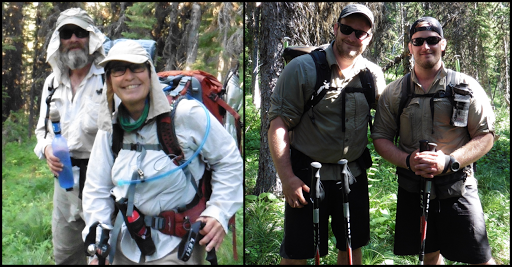 We saw two pairs of southbound thru hikers this morning. Otter & Smudge and twins Lazy Boy & Medicine Man. 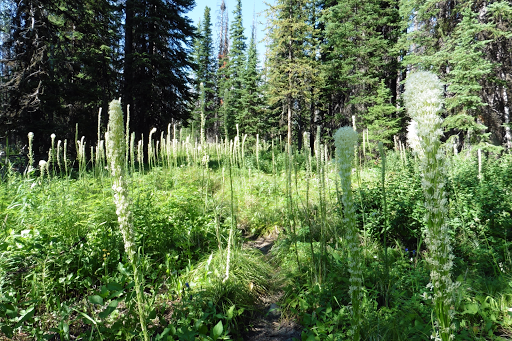 There is an alternate through this section (Spotted Bear Alt) with a nice view up on the Divide. 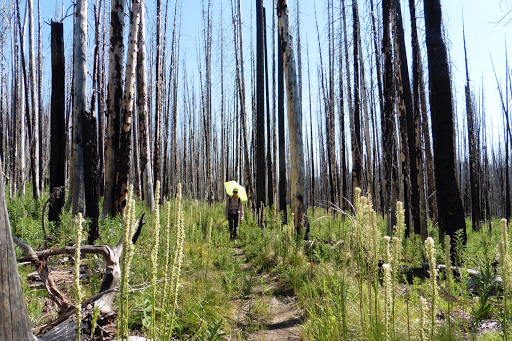 We were temped to do it, but when we got there and looked at the map more closely, we realized it was the route our 2013 fire detour took us on. 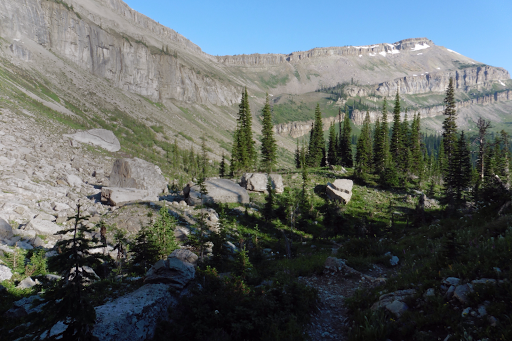 It was a nice alternate, but we decided to stick with the CDT and do the route we hadn’t done yet. 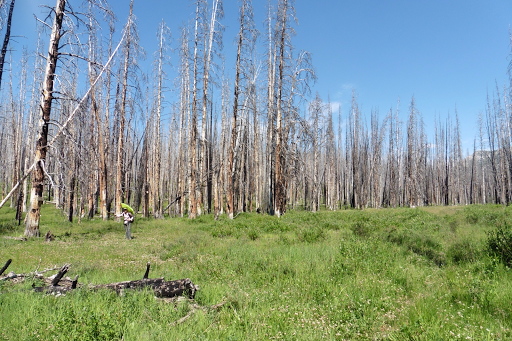 We heard it was forested and burn sections. Yep, that was it, but we still enjoyed it as it was nice trail for cruising. It got pretty hot out and my thermometer was reading 89F in the shade. 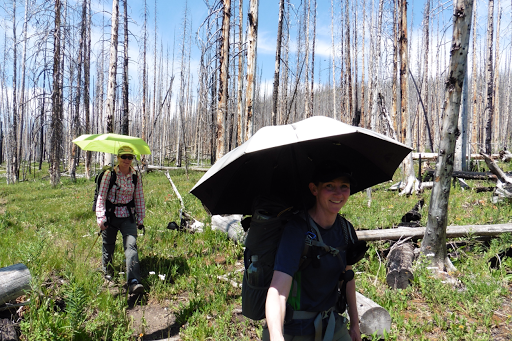 We both used our umbrellas to shield against the strong sun. At lunch, I had looked at the data book and noticed that we were a mile away from a tricky intersection. I mentioned it to E so we wouldn’t forget, but an hour later after lunch, it was gone from both our minds. We blew right past the faint turn. E took a pit stop and I hiked on cruising. Still oblivious to the fact that I was hiking directly away from the trail. I checked the Guthook App briefly about 40mins later to see my elevation and failed to notice that it wasn’t reporting my exact mileage point because I wasn’t on the trail. When I started to go downhill when I thought I should be going up, I took the time to stop and look more closely. I was waay off trail! I turned around and headed back quickly not sure if E knew I had missed the turn or if she too had missed the turn. Within 10mins I saw E and told her we were going the wrong way. We hiked back wondering how far back it was and how we missed it, both kicking ourselves since we forgot that at tricky turn was expected after lunch. It took an hour to get back and it turned out I had hiked 2.5mi on the wrong trail…which ironically enough was leading to Wrong Creek! So 5mi and 2hrs later, we were back at the intersection. It was signed, but very easy to miss if you’re not looking for it. The trail was in overgrown grass and you can see below that we went on the more defined path going straight. E is standing to the left where we should have gone and you can see there is a very faint path that most would hike right past…which we did! This is the biggest snafu either of us have made on trail. We both just got lax with how easy the cruising was and this is more likely to happen in pairs too. It was a good lesson to learn during the warmup so now we’ll be hyper aware of tricky turns for the GDT, although we were already going to be on our toes for that one. Here’s the sign that was off to the left as well as the CDT blaze that was further away and easy to miss if you aren’t looking. 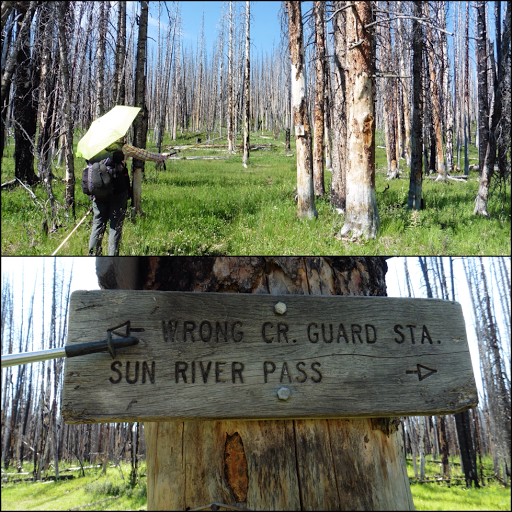 The last couple of hours, we hiked through some more burn and some slightly high brushy trail. 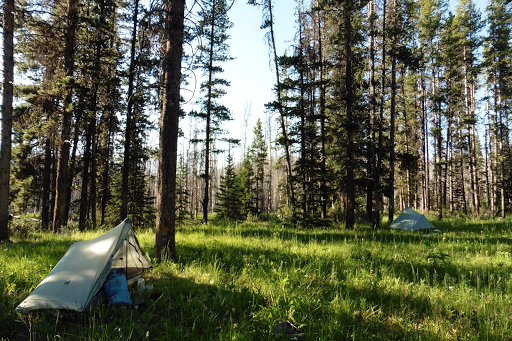 The accidental 5mi detour threw off our planned camp spot, but nicely set us up for camping near a creek and the intersection that will take us off the CDT tomorrow and back to my car over Teton Pass. We got to camp just before 6pm for another relaxing night. I’ve really been enjoying this relaxed camp time and feel spoiled. We both rinsed off in the creek and cleaned our clothes. It felt great! I love sleeping with the white noise of a creek nearby. I’m already dozing off as I type (it is almost 9pm) with the stream lulling me to sleep. The bugs are surprisingly mild too.